An overlay keyboard is a specialized keyboard with no pre-set keys. Each key can be programmed with a wide range of different functions. Overlay keyboards generally consist of a flat grid of unmarked buttons. After the keyboard is programmed, a sheet, called an overlay, is placed overtop to identify each key. The overlay can consist of any combination of words, symbols, or even pictures. Overlay keyboards have several advantages over conventional keyboards or mice. They do not require memorization of shortcut keys (i.e. F5, Alt+S, etc.) nor do they require a great deal of fine motor control, making them ideal for people who have difficulty using a conventional keyboard. Overlay keyboards are easy to clean, and are much more resistant to spills or dust. The ability to change overlay sheets also makes it easy for a single overlay keyboard to have several different uses. 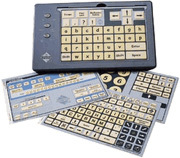 Please visit the manufacturers' websites for more information about different overlay keyboard models. Reduce keystrokes and automate your most common tasks with the Enterpad. This keyboard allows you to improve your procedures and metrics by reducing the time it takes to perform routine essential tasks. 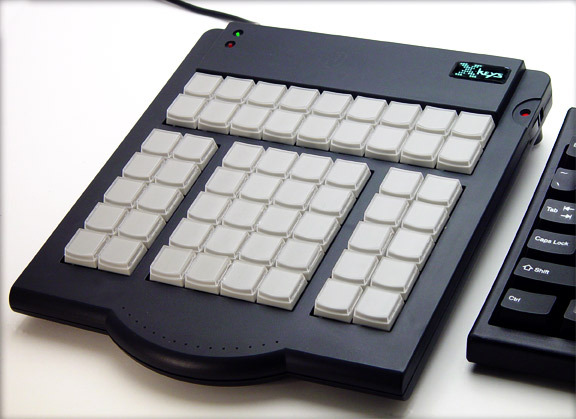 The Enterpad is plugged like a traditional keyboard and is compatible with all your software. Unlike some other overlay keyboards, no special drivers or hardware interface are required when used with DOS or Windows. IntelliKeys provides access for anyone with physical, visual, or cognitive disabilities who has difficulty using a standard keyboard. In combination with its many overlays, it is the most flexible alternative keyboard available, providing individualized support for young students, struggling learners, and ESL students. From P.I. Engineering, X-keys programmable key pads place anything from keyboard shortcuts to names and addresses at your fingertips. Instant recording of your typing turns multiple keystrokes into a single touch. © 2017, OverlayKeyboard.com. All rights reserved. All registered trademarks and/or materials are copyrighted to their respective owners.